Nigeria coach Stephen Keshi has claimed his side's struggles in qualifying for the 2015 Africa Cup of Nations are the result of "sabotage". The Super Eagles suffered a shock 1-0 defeat by Sudan on Saturday, and are bottom of Group A with only one point. Nigeria have many off-field issues, with the football federation in crisis and Keshi working without a contract. "There is sabotage by some people. 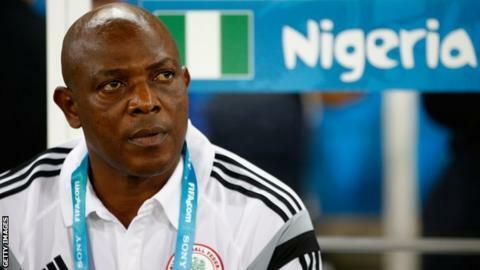 I won't mention their names but they know themselves," said Keshi. "They want to run this team down. Some people are ready to sell this country for a dime. They want to sabotage the Super Eagles. "It's a shame. They don't want this team to get to the Nations Cup, they want this team to lose outright." Nigeria host Sudan, who are now third in the standings with three points, in a return fixture on Wednesday in Abuja. Next month, they travel to second-placed Congo, who defeated them 3-2 in September, before the arrival of group leaders South Africa. The Super Eagles have to win all three matches and hope other results go their way if they are to stand any chance of qualifying for the finals in Morocco in January. Newly-elected Nigeria Football Federation president Amaju Pinnick has criticised the team's qualifying performances but says there is no rush to make a decision over Keshi's future. "It is embarrassing that, as reigning champions, we are struggling in the qualifying series, with only one point out of a possible nine. It is an awful output," he said. "However, we want our people to be patient and not stampede the federation to take knee-jerk decisions that will backfire in the end."